205) St. Mary of Zion Church - The Arc of the Covenant?! كنيسة القديسة مريم، صهيون - تابوت العهد؟! Also in front of the Holy Altar there was a bronze altar (maybe), seems that it was a present that was never used.. As putting it in front of the Iconostays shows that it was not used as an Altar.. At the very back of the Church there was an ancient manuscript about the Life and Miracles of Virgin Mary.. It had some very beautiful paintings.. Then I went to the Monastery, it had some magnificent ancient paintings.. And large frescos..
هناك كذلك أمام المذبح، مذبح من البرونز ربما، ويبدو أنه هدية لم تستخدم.. حيث مكان وجوده يوضح أنه لا يستخدم كمذبح.. يوجد أيضاً في خلفية الكنيسة مخطوط أثري عن حياة ومعجزات القديسة مريم العذراء.. وبه بعض الرسومات الرائعة.. ثم دخلت الدير، وبه بعض الأيقونات الأثرية المتميزة.. وأيقونات الفريسكو الكبيرة..
Ethiopians claim that the Ark of the Covenant is in Ethiopia, we took photographs of the building that they claim that the Tabot is there.. 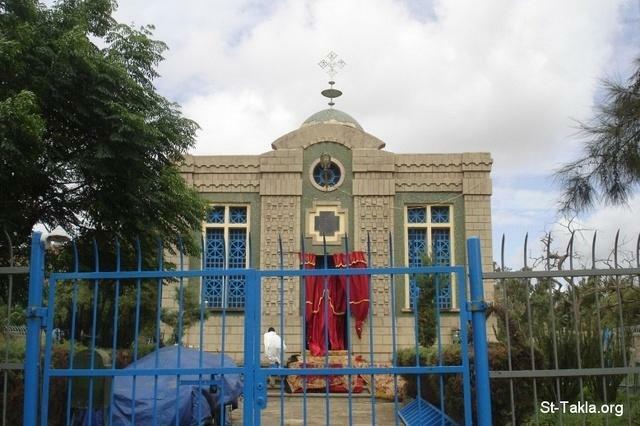 It is forbidden to enter that building at all, from anyone, even the Patriarch of Ethiopia!!!! Only one monk lives there inside that building.. 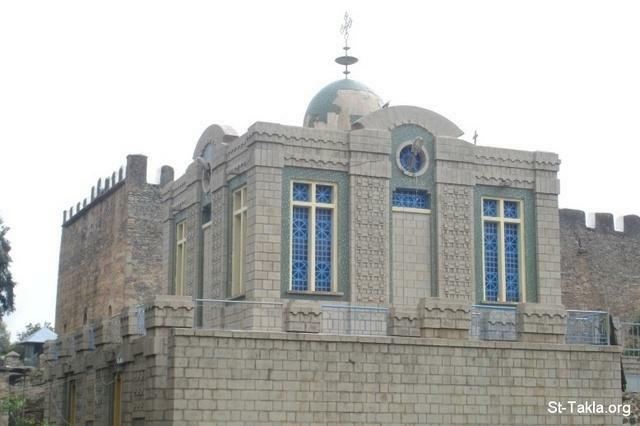 They say that after the visit of the Queen of Sheba to Solomon, she bore His child, and the relationships between the two countries started, and the Ark of the Covenant was brought too Ethiopia..
يدّعي الأحباش وجود تابوت العهد في الحبشة، وقمنا بتصوير المبنى الذي يُقال أن التابوت موجود فيه.. المبنى غير مسموح لأي أحد على الإطلاق دخوله، حتى بطريرك الحبشة!!!! إلا راهب واحد يعيش في داخل المبنى.. ويقولون أنه بعد زيارة ملكة سبأ للحبشة، قد أنجبت ابناً لسليمان، وبدأت العلاقات بين البلدين، وأُحْضِر تابوت العهد إليها.. I remembered the movie of Indiana Jones: Raiders of the Lost Arc.. I asked them, why they don’t allow anyone to see what’s inside the building?! And how come it was allowed for Jewish people to see the Tabot in the Old Testament, but now you don’t?!! 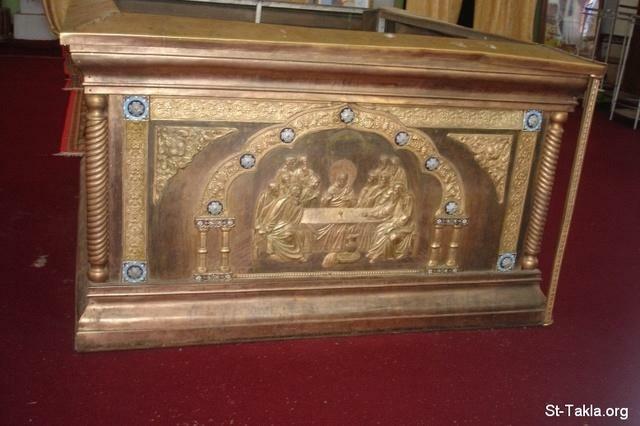 Of course the Leviticus Priests was the only ones allowed to carry it, but seeing it is something different.. I was told that they have fear that the Jewish might steal it..! I told them that there are tons of protection ways, other that this secrecy issue.. It may just mean that the whole matter is not true from the first place! And that’s maybe why your claims is not known around the world, and it is not proved historically.. The funny thing is that the building was surrounded by some metallic bars, but I didn’t see any guards around it!! تذكرت فيلم إنديانا جونز والغارات للحصول على التابوت المفقود.. سألتهم لماذا لا يسمحون لأحد أن يرى ما في داخل المبنى؟! وكيف كان يُسمح للناس برؤية التابوت في العهد القديم، وأنتم لا تسمحون بهذا الآن؟!! كان بالطبع يحمله الكهنة، ولكن الرؤية أمراً آخر.. فقيل لي أنهم يخشون أن يقوم اليهود بسرقته..! فأخبرتهم أنه هناك مئات الطرق للحماية، أما موضوع السرية هذا.. فربما يعني عدم صحة الأمر من الأساس! وأنه لهذا السبب غير معروف عالمياً ما تدعونه، وغير ثابت تاريخياً.. الطريف أن المبنى مُحاط بسور قضبان حديدية، ولكني لم أرَ أي حراس حوله! !